Stock Scratch/Notepad refills - Order Online - over 40 styles in stock, ready to ship. Our Refills are sold in packages of 10 pads per pack. 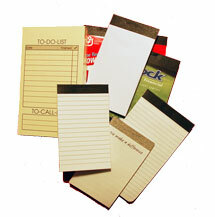 Having trouble finding the correct memo pad refill size, call us today, we can help. Volume discounts are applied and shown in shopping cart. Sizes are actual pad size including the tape binding stub. Flat Rate Shipping of only $5.00 in Continent United States per scratch pad/notepad refill order, any quantity! Only $12.95 for International Flat Rate Shipping* on scratch pads/notepad refills! 2 1/4x3 3/4 Mini To-Do Memo Pads, 40 sheets per pad, ivory paper. Minimum Quantity is 10 Pads, Sold in packages of 10. Please enter the number of pads in increments of 10. 2 1/4x3 3/4 Mini Ruled Lined Pads, 40 sheets per pad, ivory paper. 2 1/4x3 3/4 Mini Blank Pads, 40 sheets per pad, white paper. 2 1/8x4 1/8 Memo Blank White Pads, 40 sheets per pad, white paper. 2 1/4x4 Blank White Pads, 40 sheets per pad, white paper. 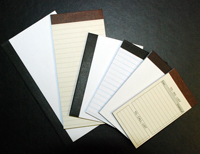 2 1/4x4 Mini To-Do Pads, 40 sheets per pad, ivory paper. 2 1/4x4 1/4 Blank White Pads, 40 sheets per pad, white paper. 2 1/4x4 1/4 Ruled White memo Pad, 40 sheets per pad, white paper. 2 1/4x4 1/4 Blank Ivory Pads, 40 sheets per pad, Ivory paper. 2 1/4x4 1/4 Ruled Ivory Pads, 40 sheets per pad, Ivory paper. 2 7/16x4 1/8 Blank White Pads, 40 sheets per pad, white paper. 2 5/8x4 1/8 Blank White Pads, 40 sheets per pad, white paper. 2 3/4x4 Blank White Pads, 40 sheets per pad, white paper. 2 3/4x4 3/4 Ruled White Pads, 35 sheets per pad, white paper. 2 3/4x4 3/4 Blank White Pads, 50 sheets per pad, white paper. 3 1/8x4 5/8 Blank or Ruled White Pads, 40 sheets per pad, white paper. 3x5 Blank White Pads, 40 sheets per pad, white paper. 3x5 Ruled White Pads, 40 sheets per pad, white paper. 3 1/4x5 Blank White Pads, 40 sheets per pad, white paper. 2 5/8x5 1/2 Blank White Pads, 25 sheets per pad, white paper. 2 3/4x6 Blank White Pads, 40 sheets per pad, white paper. 2 3/4x6 Ruled White Pads, 40 sheets per pad, white paper. 2 3/4x6 Blank Ivory Pads, 40 sheets per pad, Ivory paper. 2 3/4x6 Ruled Ivory Pads, 40 sheets per pad, Ivory paper. *To our international customers: Our $12.95 flat rate international shipping applies to any order that can fit into an 8 1/2" x 11" international shipping envelope (generally, 10 to 20 items). Be assured that if the order exceeds the capacity of the envelope, we will ship your memo pads at the best possible rate.